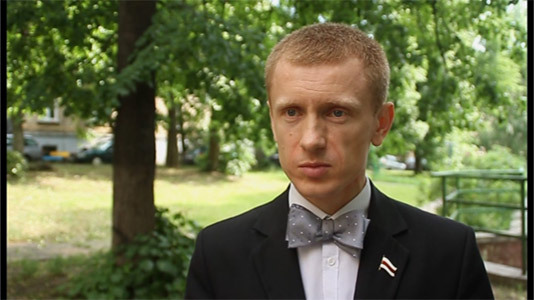 Gay-parades can lead to moral degradation of Belarusian society. This opinion is shared by Aliaksey Yanukevich, the chairman of the most pro-nationalist BPF party in the country. —Do gay people face any problem in Belarus? I’m not an expert on this issue. I don’t know if such a problem exists in Belarus. We don’t attend to the issue. There isn’t much in the media on the topic. At least, I don’t feel there’s an acute problem there. The issue is not a priority for the Belarusian Popular Front, anyway. Everyone has the right to stand for their interests, ideals and values. But we’re not planning to participate in solving this problem. First of all, I think we should protect traditional moral values, shared by the majority of our party members. —But the fact is we have to determine what constitutes traditional values today, isn’t it? —So, do you believe a gay-parade would be undesirable in our country? I believe that such events could undermine the bases of our society. They might cause moral degradation of Belarusian society. —We have seen the organizers of the ‘Chernobyl Rally’ approaching a group of people from LGBT with rainbow flags and asking them to either remove the symbols or leave the column. Why did it happen? Since it applies to any participant. The organizers prepare an event, and it takes place under certain slogans. What do gays have to do with it? There must be the symbols that were planned by the organizers. —But there were the party flags at the event, the “Young Front” streamers for example. And the theme of the event was “Freedom for political prisoners!” Why were the rainbow flag carriers driven away? I’m not against them. I’m against the use of symbols and slogans that don’t meet the stated theme of the event, like adherents of the Customs Union or Cossacks, or whoever. Let them organize their own events to state their goals and aspirations. Basically, I don’t care what sexual orientation a person has, but I loathe public display of any sexual orientation.